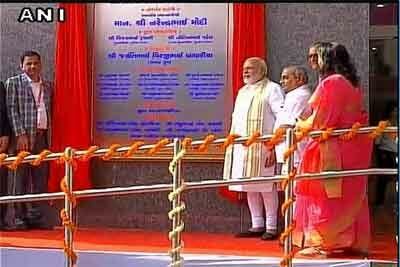 Surat: Prime Minister Narendra Modi inaugurated the Kiran Multispeciality Hospital. Prime Minister Modi who arrived in Surat yesterday on a two-day visit will also inaugurate a diamond manufacturing unit of a Private company at Hira Bourse Special Economic Zone at Ichhapore in the district. The Prime Minister will also go to Bajipura village in Tapi district to inaugurate a cattle feed plant and ice-cream plant of Sumul Dairy and lay the foundation stone for dairy products plant at Nava Pardi. He will also address a large gathering there. Prime Minister Modi will then visit Silvassa town in the Union Territory of Dadra and Nagar Haveli, where he will address a gathering apart from inaugurating a few projects. The Prime Minister in Saurashtra will inaugurate phase-1 of the ambitious Saurashtra Narmada Avtaran Irrigation project for Botad and surrounding districts and also lay foundation stone for the phase-2. Under the project divided in four phases, the Gujarat Government plans to fill 115 dams of Saurashtra region with overflowing water of Sardar Sarovar Dam across river Narmada through a web of pipeline network. This is Prime Minister Modi’s second visit to his home state this year. He had visited Gandhinagar on March 8 to address women sarpanchs from across the country on International Women’s Day.